My newest collection with Pink Paislee called PICK-ME-UP is arriving in stores now! I thought it would be fun to share a few of my and my design team’s layouts using Pick-Me-Up to see some fun varieties of styles of pages! 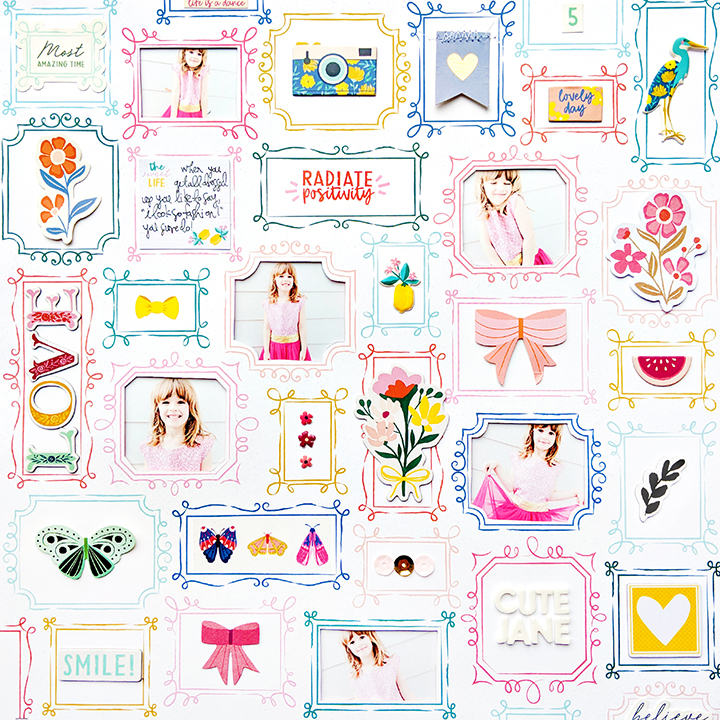 On this layout I used Paper 19 with all of the frames as little places to highlight photos and embellishments! 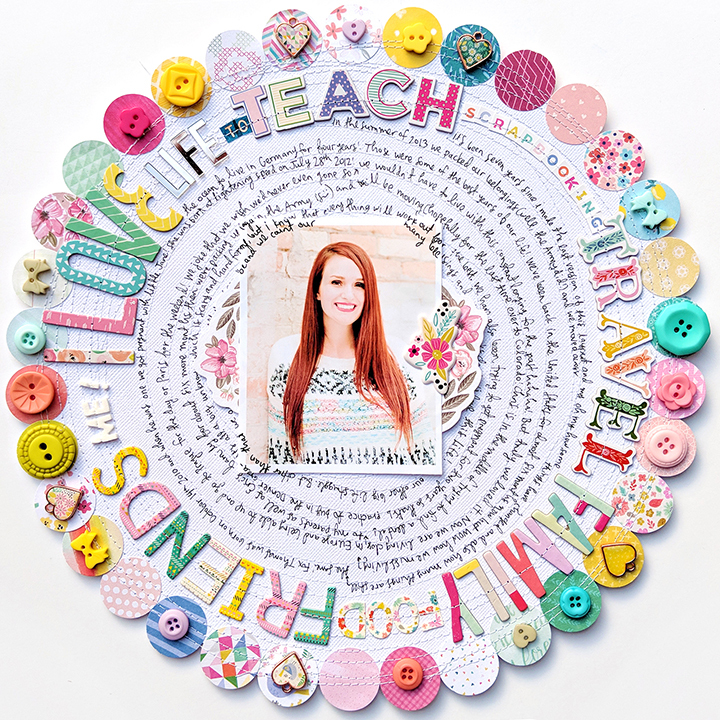 My Design Team member Missy Whidden created this layout with Pick-Me-Up and featured my Folk Art Flower cut file. The beautiful background does most of the work and only a few embellishments tucked here and there finish off this beautiful page! On this layout I scraplifted myself! I made a page back in 2010 when I was pregnant with my son Fox and needed some inspiration for creating a new layout. I flipped through one of my old scrapbooks and came across a round layout to lift using new products! You can find the process video for this over on my YouTube channel. I challenged another one of my Design Team members, Lorilei Murphy (aka Rosey Posey Studio!) 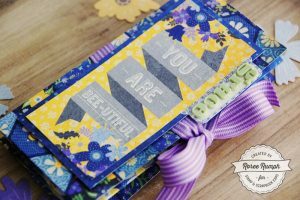 to create a layout using only Pick-Me-Up patterned papers and a few limited supplies (buttons, string, doily, etc.). 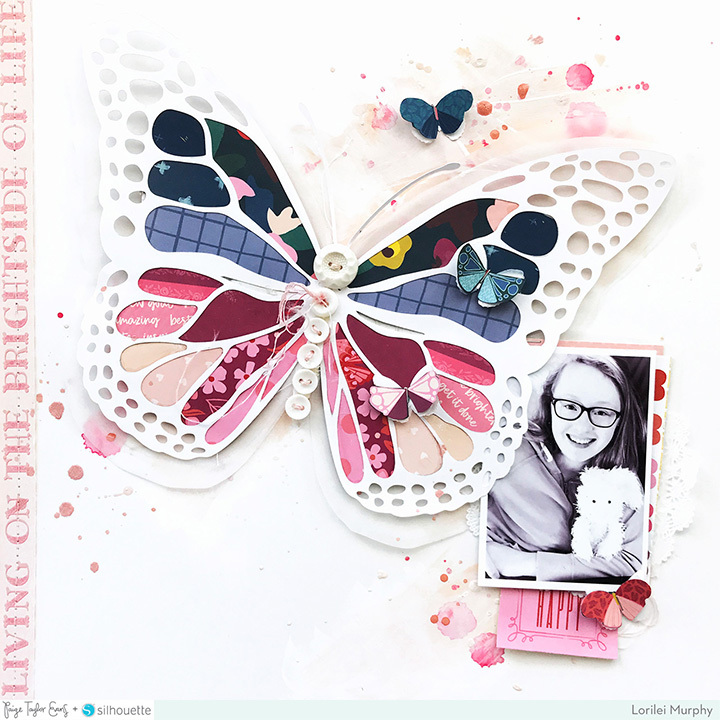 I love how she backed my Butterfly cut file with pretty patterned papers and did some mixed media on the background! 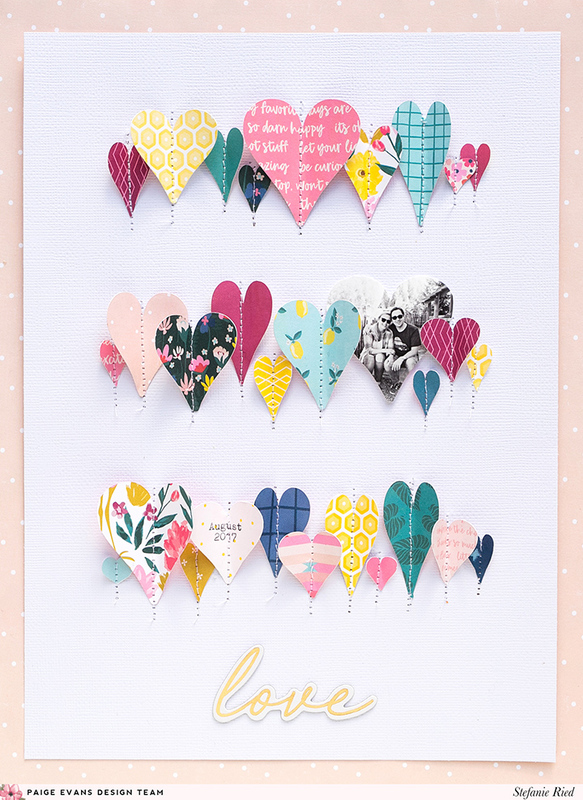 Last but certainly not least, my Design Team member Stefanie Ried used my Hearts Heart cut file to make a plethora of patterned paper hearts from Pick-Me-Up papers that she stitched in rows across her simply stunning page. I hope you are inspired to pick up Pick-Me-Up soon! This entry was posted in Blog, Scrapbooking, Technique Spotlight and tagged 12x12 layout, Paige Evans, Pink Paislee, Scrapbooking. 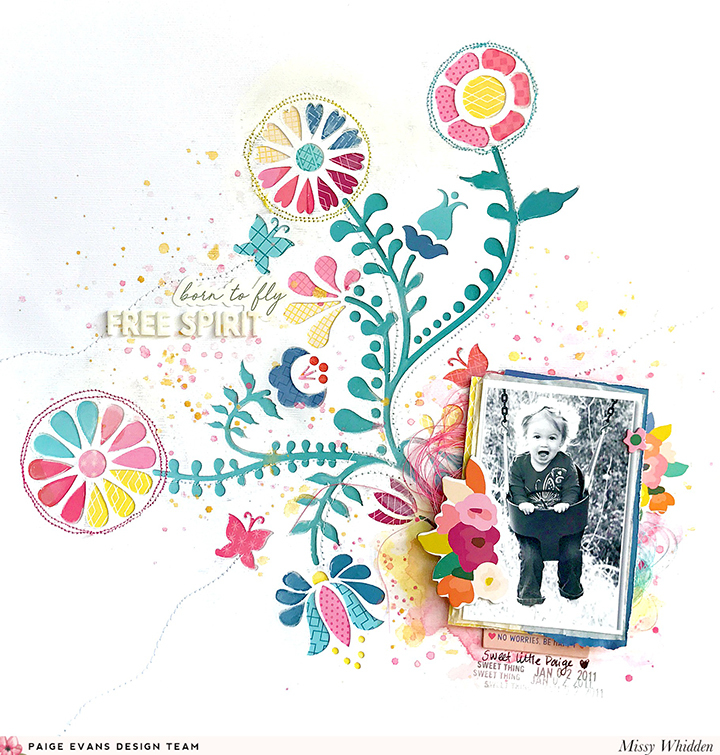 Loved the free spirit scrap page. Didn’t lose the pix. I do a lot of Scrapbooking with primary colors and “boy stuff”….boymom here!! But you’re items are beautiful. This is going to be a great week! 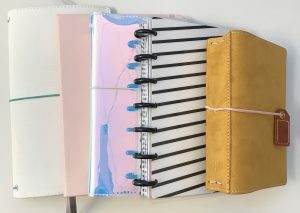 I love all the ideas and products. 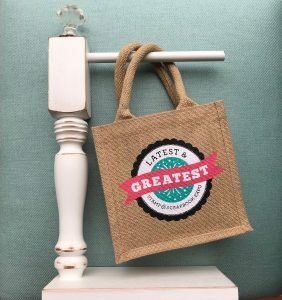 I love this fun week of crafting ideas and products. Thanks for the giveaways! Look forward to getting this item. I luv the windows!!! Super cute! Such incredible ingenuity and always colorful! Very different lay outs. Almost caught up with my 18 year old granddaughter’s pages…whew!